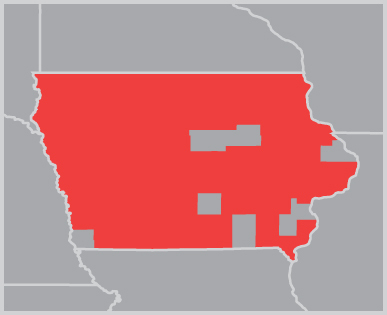 Iowa is served by the North Central Division office in Rochester MN with sub-offices in Mason City IA and Fort Dodge IA. Fairway has billboards in 90 of the 99 Iowa Counties. 400 poster faces north of I-80 target both mid-sized cities as well as rural agricultural markets. Bulletins total almost 500 with good distribution of 14’x48’ units in Des Moines. Shipping:Contact your sales person for shipping info.